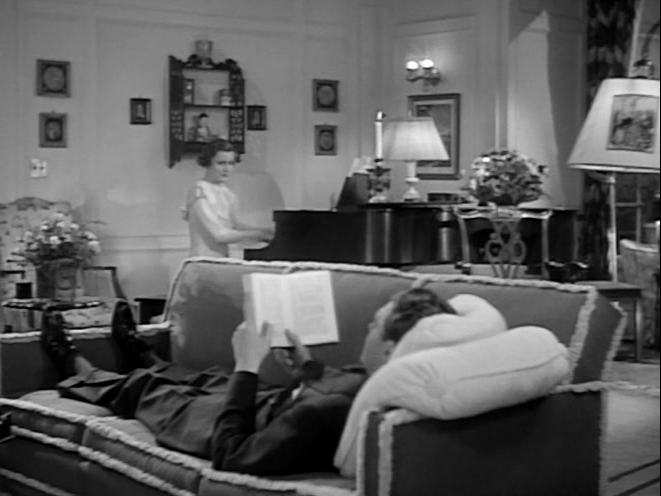 An evening at the Dunlap's house: Tony (Irene) playing the piano - and it's a Steinway, folks - and her husband Jim (Ralph Bellamy) reading. Better trying to read if his wife would only let him instead of making noisy things or talking to him about the plans for their son's future, which is really an urgent topic considering the fact that Jeremy is already in the advanced age of two.
" Tony, what do you know about me?" Soon we learn that Tony knows everything about Fran, town's gossip took care of that in the last years, and that she is sure of her and Jim's love. A love Tony appreciates even more because she had a very uneasy childhood as kid of a painter and a Prima Donna who not only playing the femme fatale on stage at last eloped with the tenor and thus ruined Tony's father's career. Tony is herself a painter whose landscape paintings reflect her wish for nothing more than her calm life with Jim and Jeremy. Fran (Constance Cummings) is back in town! Up for a conversation piece of a film? True to its definition of depending chiefly on its wit of dialogue, taking place in upper-class circles and getting the action started through occurrences from without? “This Man Is Mine” made me laugh, touched me sometimes (Miss Dunne took care of that) and made me smile about the stupidity of mankind. If we are not confronted with real problems - some existential ones for instance - we are all good at inventing some trouble on our own. The film touches with a light hand the question if real happiness is contentment - or let's say the kind of happiness which offers some lasting quality - and shows how quickly human relationships change and leave us on a very slippery ground. Certainly the characters are well-known ones: the husband not really appreciating the beautiful, painting, singing, piano playing, heart of gold wife of his - which REALLY makes you wonder what men are looking for - the all enduring wife fighting for her little niche of the world, and of course femme fatale Fran. 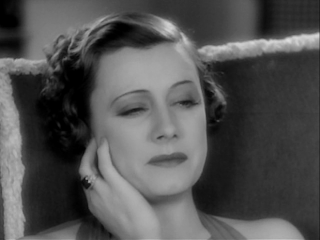 She is a cliché on legs - manipulative and phony as can be, but she meets her male match - someone she thinks even she may not be able to handle - in the end, which is one of the nice tidbits of the film. However, the whole thing is really entertaining with some great lines of dialogue and an in its entirety very well picked cast. 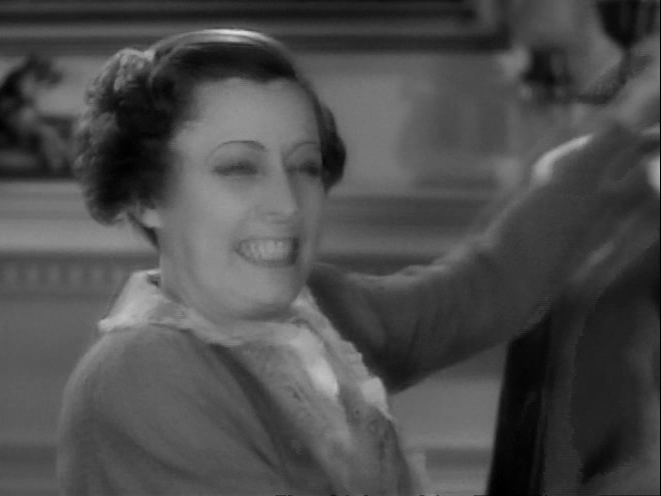 I especially like Kay Johnson as Irene's sidekick soberly commenting the happenings and at the same time being true to her friend Tony. I have always a weakness for these kind of characters so wonderfully represented by actresses like Kay Johnson, Jean Dixon and Eve Arden of course - just to name a few. 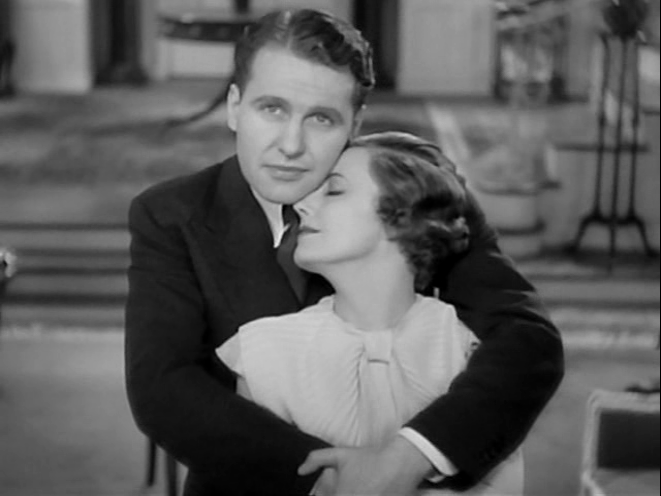 This is the first time that Ralph Bellamy and Irene shared the screen and for once he is her leading man and not the third part of a triangle and the second male lead. Bellamy does a good job but simply isn't in Irene's league of acting, he just doesn't move around in that range of capabilities of expression, which brings me once again back to Miss Dunne. There is a lot more about Tony than just being the “little wife” though she is initially presented like that, and Irene squeezes out of that role what there is to squeeze. From a restraint reaction to Jim's wish for a divorce - Irene plays that consequently at the brink of a breakdown which is really touching - to the end when Tony hits Jim with one of her paintings over the head - about time for that and the prelude to their reconciliation. In hindsight and with the knowledge of the comedies to come this scene gets a quality of its own. 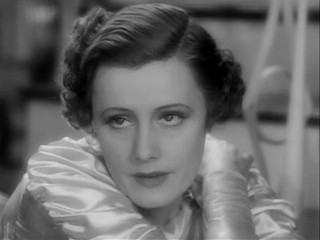 “This Man Is Mine” teams Irene the third time with director John Cromwell and once again I admire the way how he handles the close ups, finds interesting camera angles and keeps the whole film in a fine balance. This is not a great, "must see" film but if you are in the mood for a rather talkative, stagy movie, with great acting , some comic dialogue and touching lightly some serious topics, this could be the choice for the evening. But if you are a Dunne enthusiast, this film is simply a must. Leaves my Irene tidbit: there is a very, very short scene in which Irene chews gum - a habit normally reserved for dubious girls in that film era. If I needed a hint that Tony has some “tough cookie” qualities there it is - not solely about roses and lavender that lady! Again, I enjoyed your new review very much, Susanne. 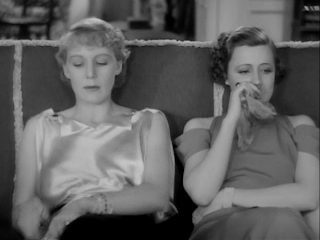 I like the film mostly because of Ms. Dunne and Kay Johnson and all that sassy talk they have. 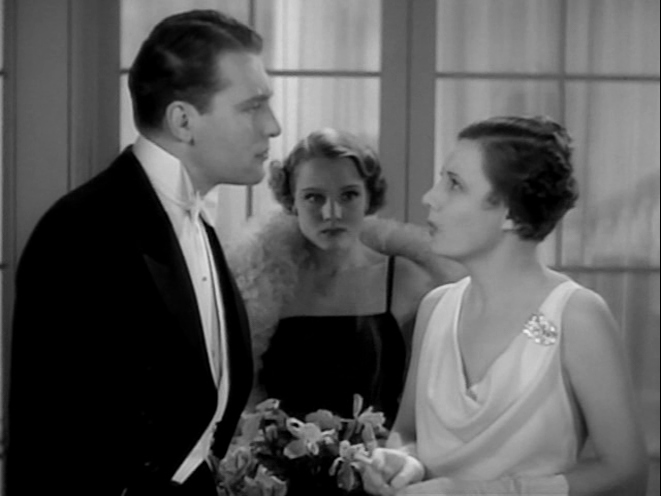 I can’t warm up to Ralph Bellamy as Ms. Dunne’s husband. He can’t keep up with Ms. Dunne’s excellent acting. Thank you for the tidbit about the chewing-gum scene. I wondered about it and what Ms. Dunne wanted us to say with it. In private she wasn’t known as a “chewing-gum-girl”. 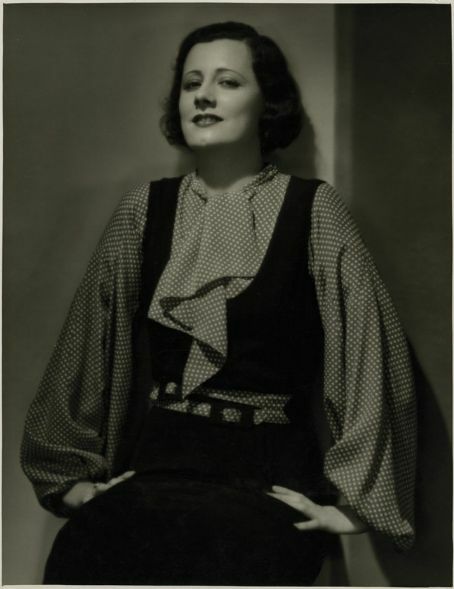 But it’s once again a proof for her excellent preparation of the parts and how she saw HER (her character). I just saw it for the first time Susanne and I really LOVED it but when did Tony chew gum?? I must have missed that detail! Please let me know so I can watch again! !